Stubby was just another stray dog before he found his way into an area near Yale University where the 102nd infantry, Yankee Division was training for World War I. Private J. Robert Conroy found the puppy there in 1917 and named him Stubby on account of his short tail. Although animals were not allowed in the regiment, Stubby was allowed to stick around because he was smart and boosted morale. He learned the bugle calls, the drills and even a modified salute where he put his right paw on his right eyebrow. Later he proved his usefulness at war. Conroy smuggled the pooch aboard a ship to France, and when he was discovered by Conroy's commanding officer, Stubby won him over with an adorable salute. He was allowed to join the soldiers on the front lines, where he was once injured during a gas strike. Having developed a sensitivity to the smell of gas, he was able to save the soldiers as they slept through another gas attack. He even thwarted a German soldier's attempts to map out the layout of Allied trenches by biting him on the leg and subduing him until U.S. soldiers arrived. 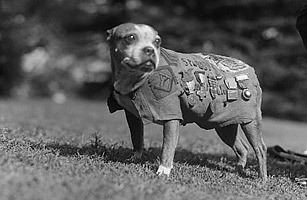 By the end of the war, Stubby had served in 17 battles and had developed a knack for locating his wounded comrades. The dog became a lifetime member of the American Legion and later became Georgetown University's mascot when Conroy went to study law there. In 1921 the pooch was awarded a gold hero dog's medal that was commissioned by the Humane Education Society. He lived until 1926.